Tender bites of chicken breast and cheesy tortellini are served in a creamy tomato basil sauce. 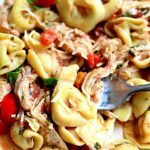 It’s made in your slow cooker and is a no fuss recipe! Add chicken, tomatoes, garlic, Italian seasoning, salt, pepper and tortellini to the slow cooker. Stir a bit. Cover and cook on high for 2-4 hours, or until chicken and tortellini are cooked through. Each slow cooker cooks differently. Remove the lid and stir in the half and half, parmesan cheese and basil. Salt and pepper to taste. Tortellini: I used a 19 ounce bag of frozen cheese tortellini. I believe that you could use fresh tortellini, although I’ve never tried it so I can’t say for sure. Chicken breasts: I used 2 uncooked chicken breast halves and cut them into bite size pieces. You could also use cooked and cubed chicken or even rotisserie chicken.